This book seemed like it was going to be a lot of fun to read, so I am really bummed that I didn't like it. The plot of this story seemed like a fun and crazy adventure, but it sort of came off as just completely unbelievable. What was so unbelievable was how okay Candy was with getting kidnapped. She seemed to accept it and be totally fine so quickly! I expected more fear, anxiety, and danger. I couldn't believe how chill Candy was about the situation. The first half of the book was very frustrating for me, mainly because of that fact. However, I did think the second half of the book was better paced and more enjoyable. The main character, Candy, was such a hard character to root for. She was just plain annoying. One of the things that bothered me the post about Candy was how she came up with nicknames for everyone. They all just felt very immature. I hated how she labeled everyone and judged people without ever getting to know them. I thought she was also extremely self-absorbed, whiny, and extremely judgemental. I will say that was extremely free spirited, which was fun to read about, but I couldn't get past her other characteristics. Maybe I am just getting too old to connect with teenagers, I'm not sure! I will say that she goes through some changes and realizes how poorly she was behaving, which I was very happy about, but it felt very rushed and not well developed to me. 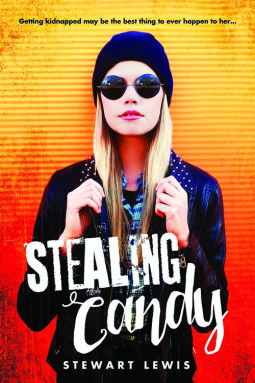 If there will be a sequel to this book, I hope the author works on making Candy a more kind hearted and relatable character. I can tell the author has the potential to make Candy a character I can actually like and connect with, so I hope that is what the future has in store! Overall, this book just wasn't for me.